Wedding Edition: One Week Left! One week from to day I will be Mrs. Nathan Palatsky! Crazy right? I am so excited to start this new stage of my life serving God with my husband. I just hope he feels the same! With the big day being on one week away, I realized I needed to organize decorations, supplies, and an emergency kit to make sure everything gets to the ceremony and reception site. Oh and I also have to bring some of the presents we received early. The ceremony site is two hours away so I must make sure I don’t forget anything! Today was my least favorite part of the whole wedding preparations. So tedious! I started by dividing items into ceremony, reception, decorations, and supplies. Honestly I didn’t have a great system. I just tried to keep similar items together, for example, the florals and extra floral supplies. I’m so glad the end of this preparing is near! With one week left I have a prayer request. Three people involved in the wedding are sick: our pastor, flower girl, and ring bearer (all of the same family). Please pray that their entire family gets well soon. I will be posting again on Thursday so check back! It was such a great time to come together as sisters and create something together. That quality time is one of my favorite parts of coming home for Christmas. No matter where we are, if we are all together, we are home. The following is a tutorial of one of the types of bracelets we made. I especially liked this type of bracelet because it was so classy and ended up matching the outfit I was wearing at the time! Begin with a strand of hemp cord (in this case we used waxed Irish linen cord which worked nicely) that is long enough to fit around your wrist with a little extra room. Quadruple this amount by folding it over three times and cut. You should have four strands with one loop on one end and two loops on the other. Take the end with two loops and make a knot to create a loop big enough for your button to slide through.Then tape your loop to the table and cut the single loop on the opposite in order to have four loose strands (Figure 1). Separate your strands into pairs and then tape the ends to the table about pencil width apart, keeping the strands taut. Then take thread (we used nylon thread) and double it and knot it right up next to your cord knot. Next, start “figure-eighting” with your thread and needle. (Figure 2) To figure-eight, take your needle and start from the outside of the left strands and go under them and up into the middle section. Then go over the right strands and come around and under them, coming up into the middle section. Then go over the left strands and come around and under them, coming up into the middle again. Do this over-under “figure eight” movement several times, sliding the thread up to the knot tightly after completing the figure eight. Now you are ready to begin adding beads! Your thread should be coming up from the middle at this point. Thread your bead onto the strand (Figure 3). Now go over the left strands and around and come under them into the middle (Figure 6). You have now completed the figure eight pattern and are ready to add another bead! (Figure 7). Continue adding the beads in the figure eight pattern until your bracelet reaches the desired length. At that point, stop adding beads, but figure eight several times to end your piece. Knot the thread (we used clear finger nail polish to secure the ends of the thread knots to the bracelet after finishing). Now take the middle two strands (one from each pair) and slide them through the shank of your button. Use the remaining two strands to knot the button onto your bracelet. (Figure 8) After knotting it a couple of times, double check that your bracelet fits. Then cut the strands and fray the edges. The big day is only a week and a half away! Can you believe it?! The next few days are going to be full of activity! I still have to pick up my dress! Over Thanksgiving my mother, sisters, and I finished all the bouquets and boutonnieres. It was a great time for fellowship and we got some of the dirty work done! Alex and Mom had started the bouquets a few weeks earlier to surprise me with some progress. I must admit it was a wonderful surprise knowing I didn’t have to do everything. All the supplies were bought at Michael’s. I must give Alex most of the credit for her creative genius with flower arranging. Here they are! What do you think? Christmas like all other holidays gives us an excuse to practice hospitality. Here is a menu for Rick’s office party. What I have learned over the years is that I like to prepare old favorites and something new. 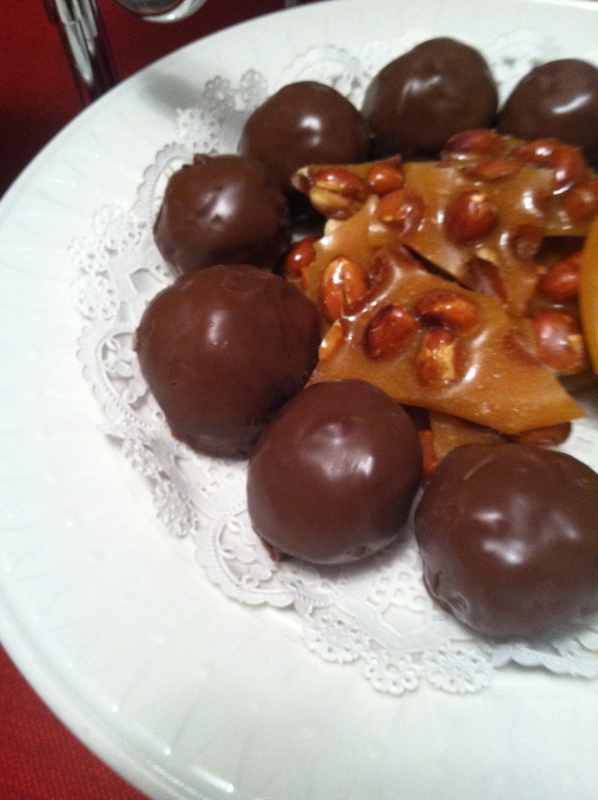 In this menu I have three of our holiday favorites, Peanut Butter Crispy Balls, Molasses Sugar Cookies and Eggnog. Mackenzie had the privilege of mixing up the Peanut Butter Crispy Balls. Since it is a favorite, she quadrupled the recipe. Yep, I said quadrupled. I hope this is the only time we have to mix these this season. I freeze them and pull out only the amount we need for the occasion or else we eat them all before the next party and have to make them again. The Molasses Sugar Cookies are a historical favorite. Rick’s grandma Viola used to make these for him and his siblings when they stopped over to her house for lunch or after school. They have been a staple in our household and the kids love them. Making eggnog became a tradition for Rick and I early in our marriage. Our kids have never liked it but humor me and try it every year. To save time one year I purchased some from the store – bad idea. Homemade is much better. The remaining menu items are not unique but I had not made peanut brittle for over 15 years. I honestly don’t like making candy. There is something about sugary liquid at a high temperature that freaks me out. Who wants to get burned if something goes wrong. I’m happy to report the peanut brittle turned out perfect. I probably won’t be able to do it again. I want to try another batch – yes, this batch is already devoured. Comment below and tell me what you like to serve guests for the holidays. We have a weekly grocery budget of $50. After my trip to the store I landed the stuff for supper and to pack dinner for a grand total of $34.09. We are going for enough food to get up through the week with minimal leftovers. We’ll see how it goes! It’s halfway through December, and it’s official…this girl is in the Christmas spirit! This week at school – as most of my classes are working on finishing projects – we listened to a lot of Christmas music. There’s really nothing better to brighten your day! We have all our Christmas decorations up at home – the stockings are hung, star is atop the lighted tree, and wrapped gifts sit under the tree. Last year I worked really hard at making a lot of our decorations including our stocking and tree skirt. This year it was so nice to get them out of a box! Our tree is adorned with many sentimental ornaments that we each received growing up. I love to sit in the living room and stare at the tree and all the memories that it holds within those ornaments. Most of all – when I look at our lighted tree, I am reminded of the light that Christ was in the world and the light that I should be. A heartfelt sorrow goes out to all the families and friends of loved ones killed in the tragic shooting in Newton, Connecticut this morning. I can’t even pretend to know the grief one feels under such horrific circumstances. May God surround them with His love as they process the details of the day. Plans are always changing around here! Often times our busy schedules get in the way or something unexpected pops up…so it’s great to be flexible. In the case of last week’s menu, both the hubby and I had to go with the flow. Eventually everything from the list last week was eaten, just not in the right order 🙂 But that’s why we do this menu planning and grocery shopping – so we don’t have to think about what to eat when we get home! Do you plan out your week in advance? What’s on your menu this week? Jake and I had a old family favorite tonight for supper. This is a recipe that I snatched from his Grandma. When we got married, I wanted to be able to make some of his favorites. This is an easy recipe to replicate. It’s also great because it makes a huge pot – we will be packing this for lunch a few days this week. The weather finally got chilly – so we were really excited about this tonight! Enjoy! Boil the potatoes, celery, and onion for 20 minutes. Add the frozen vegetables and boil for an additional 10 minutes. Stir in soup and cheese until melted. Enjoy!